Could the Tumor Characteristics Identified By Colonoscopy Predict the Locally Advanced Rectal Carcinoma? Objective: To investigate the clinical and pathological characteristics of locally advanced rectal carcinoma and identification of the candidates for neoadjuvant chemoradiation (nCRT). Summary Background data: So far the nCRT has been the standard care for locally advanced rectal cancer (T3-4 or/and N1-2 lesions). But the accuracy of staging examinations (mainly ERUS and MRI) is far from excellent. Besides, such examinations or professionals are not available in many hospitals in China, while the colonoscopy and biopsy are routinely obtained before surgery. Methods: This is a retrospective study. 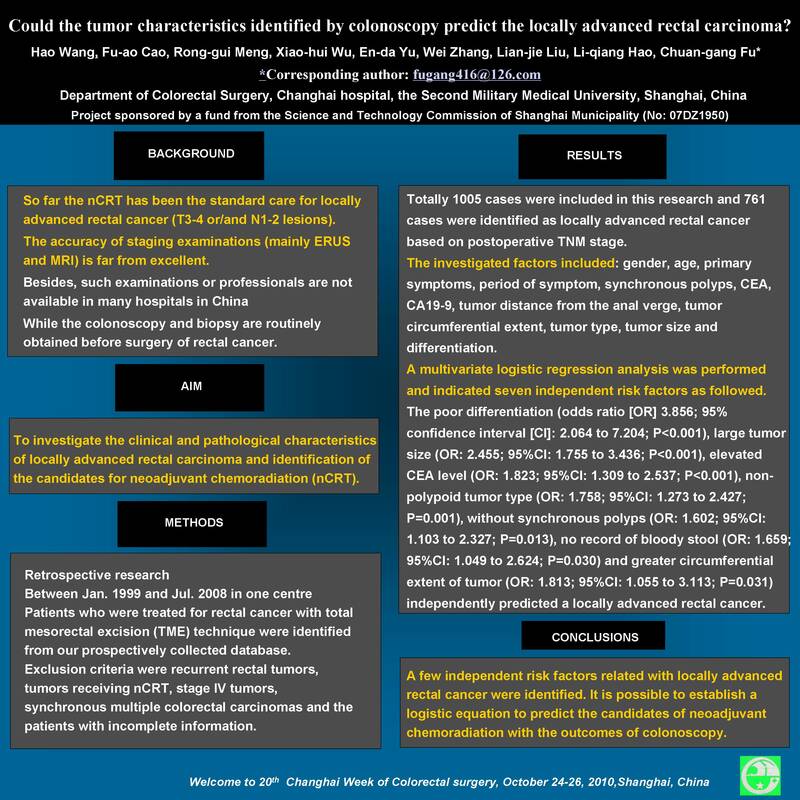 Patients who were treated for rectal cancer with total mesorectal excision (TME) technique at Changhai hospital from January 1999 to July 2008 were identified from our prospectively collected database. Patient’s characteristics, colonoscopy records, operative and pathologic reports were reviewed. Exclusion criteria were recurrent rectal tumors, tumors receiving nCRT, stage IV tumors, synchronous multiple colorectal carcinomas and the patients with incomplete information.